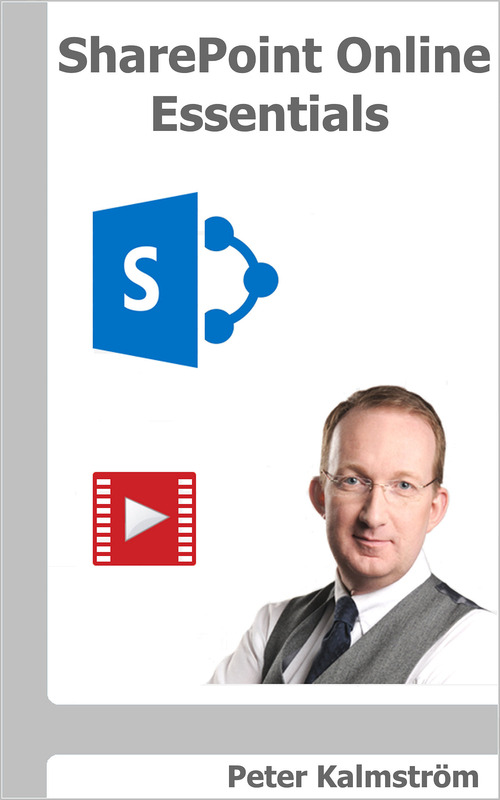 I am happy to announce the release of my new book and e-book: SharePoint Online Essentials. It is intended for SharePoint Online users with no administrative capacity – just ordinary users with the default Edit permission or less. I have earlier written several more advanced books about SharePoint Online: SharePoint Online from Scratch, SharePoint Online Exercises and SharePoint Flows from Scratch. These books have become popular among SharePoint administrators and other power users who need to understand more about SharePoint than the basics. However, I have also been asked to write a book about only those features that each SharePoint user needs to know to work efficiently with SharePoint. That is why I have put together SharePoint Online Essentials. Just like my other books, this new one has links to articles with video demonstrations from the kalmstrom.com Tips section. SharePoint Online Essentials includes basic information about classic and modern sites, pages and apps. Readers will also learn how to share content and how to work with SharePoint lists and document libraries. At the end of the new book, I have included an exercise from my book SharePoint Online Exercises: "Create a modern sites intranet". Here readers can make practical use of what they have learned by building and customizing modern team and communication sites and giving them a joint navigation. The process is explained step by step with many images. SharePoint Online Essentials can be purchased from Amazon, and the book is available as a Kindle e-book and in a paperback edition. If you buy the paperback from amazon.com you will have the e-book for free, as SharePoint Online Essentials – just like all my other books – participates in the Kindle Matchbook program. I hope that organizations who are introducing SharePoint Online to their staff will find SharePoint Online Essentials a good help when it comes to educate the users. Therefore, I have decided to nearly give it away. That is not possible on Amazon, but the e-book is only $0.99. The paperback must cover the printing costs, so here I had to accept a higher cost: $3.99. SharePoint Online Essentials may also be downloaded as a free PDF file from the European SharePoint, Office 365 & Azure Community. SharePoint Online Essentials will not make me a rich man, but in the long run, I of course hope that the book will serve as a marketing tool for my more advanced books and also for the kalmstrom.com products and services. We already see that new customers often refer to the books and the kalmstrom.com Tips articles.